This message says it all,” All Supreme Council Members directed by YB Tan Sri President to meet for discussion/deliberations regarding G4 issue @ 2.00 pm 19/3/2014 at Merdeka Palace,Kuching. It doesn’t come clearer than that does it…? An early morning interview around 830am at the Presidents residence would mean something ‘significant” would be happening for the day. President Tan Sri William Mawan was in a very casual and seemingly happy mood as we sat down for a cup of coffee. He did not want to let the cat out of the bag but he did mention to us that “there were no conditions set for the return of the ‘sacked” members” I have extended the OLIVE BRANCH and with the recent developments and the blessings of the SPDP Supreme Council the door is open for them. Should I say more Mawan asked? Tan Sri Mawan as usual was very cool and calculated in his approach. He has faced the worst in all with all the ‘dirt” thrown at him for the past three years and many names “BESTOWED UPON HIM”- (unprintable as some were very unpleasant). He told us in so many words. This is politics and whatever has happened has happened. If I thought of my own personal interests before the party wouldn’t SPDP be in a worst state. Do you think honestly we would not have closed shop? The party is the main priority and the former chief minister and the current Chief Minister knows what is bests for the party. The party wins not Tan Sri Mawan. You write this down he told us. The members and the BN family would be very happy when all is stabilised. We are not meek but we withstood the challengers when some of our members went astray. I am answerable as a leader of SPDP and as a leader I welcome them back to start a new chapter for the party. WHAT has been said and exchanged is now history and today at 12.30pm we will visit the Chief Minister. This will be a new beginning for SPDP and we wait for the moment. SPDP will be there for BN and we will continue to serve the rakyat to the bests of our parties ability and we hope not to revisit the dark years again. Tan Sri Mawan gave a short brief and direct interview as he had to attend to another function at Four Points at 930 am. The 1230pm meeting with the Chief Minister of Sarawak is attached below. 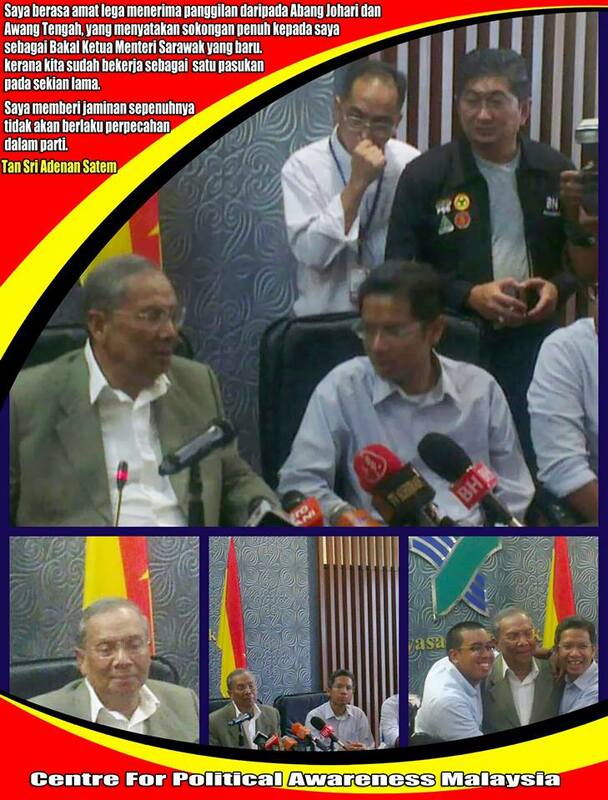 KUCHING, March 6 (Bernama) — The Sarawak Progressive Democratic Party (SPDP) ended three years of feud with its four former senior members that it sacked for insubordination by accepting them back Thursday. State assemblymen for Tasik Biru, Datuk Peter Nansian Ngusie, Datuk Sylvester Entri Muran (Marudi), Rosey Yunus (Bekenu) and Paulus Palu Gumbang (Batu Danau) were reinstated as members of SPDP with immediate effect, said Sarawak Chief Minister Tan Sri Adenan Satem. 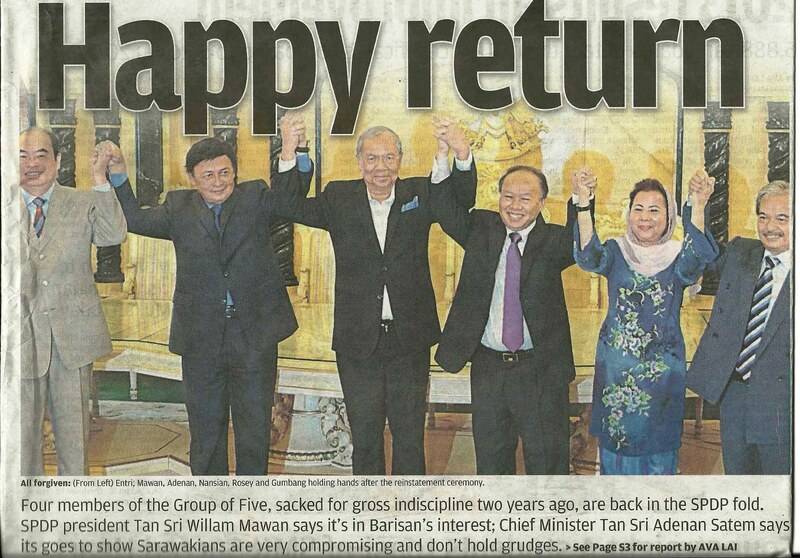 Adenan, who had been instrumental to see the readmission of the four back into the party, said their return was historical and should come as a positive step and a good news for the Barisan Nasional (BN). 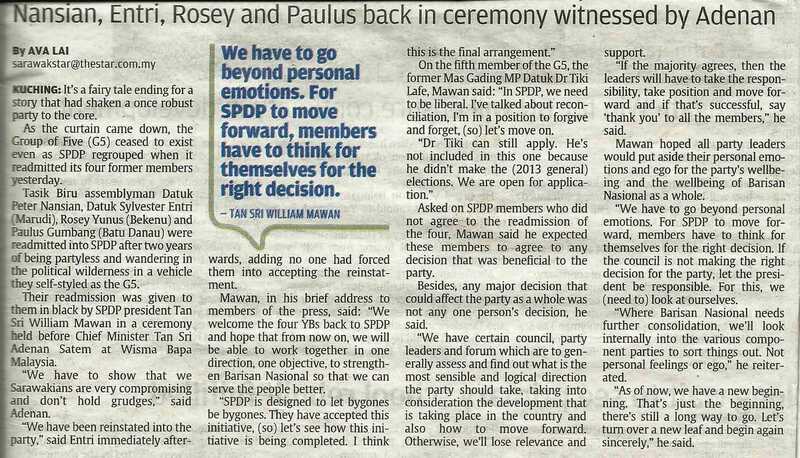 “They will just be ordinary members of SPDP. 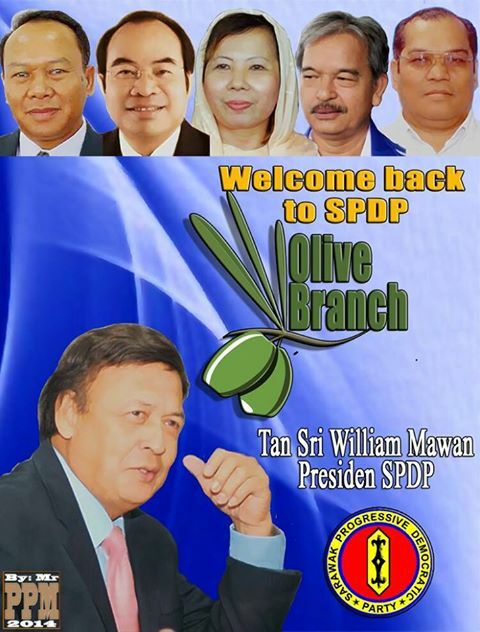 But come the next (SPDP) triennial delegates conference, they can contest (for positions in the party),” Adenan, who is also Sarawak BN chairman, told a press conference here. Earlier, he received a courtesy call from the SPDP Supreme Council led by their president Tan Sri William Mawan Ikom. Prior to being sacked from the party between 2011 and 2012, Nansian was a SPDP senior vice-president, with Entri and Rosey as vice-presidents and Paulus as assistant information chief. Meanwhile, Mawan said former Mas Gading Member of Parliament, Datuk Dr Tiki Lafe who was sacked together with the four could not be reinstated immediately as the latter had contested against BN in the 13th general election. However, he said Dr Tiki could submit his application separately to rejoin the party. Dr Tiki, who was apparently disappointed for not being re-nominated to defend the Mas Gading seat, lost to BN newcomer Anthony Nogeh Gumbek in last year’s election. Sarawak Chief Minister Tan Sri Abdul Taib Mahmud will meet the Yang Dipertua Negeri, Tun Abang Sallahuddin Abang Barieng this Saturday to submit his resignation letter and the name of his successor. The 78-year-old Taib said he was looking forward to his retirement, which he confirmed, from the post he had held for 33 years. 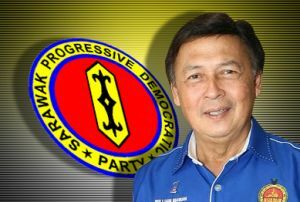 The Parti Pesaka Bumiputera Bersatu president and Sarawak BN chairman is said to be taking over as the next Yang Dipertua Negeri of Sarawak, after Abang Sallahuddin’s tenure expires at the end of the month. “I look forward to do anything useful for the country at a leisurely pace,” he told reporters when asked on his retirement plans. – February 10, 2014.